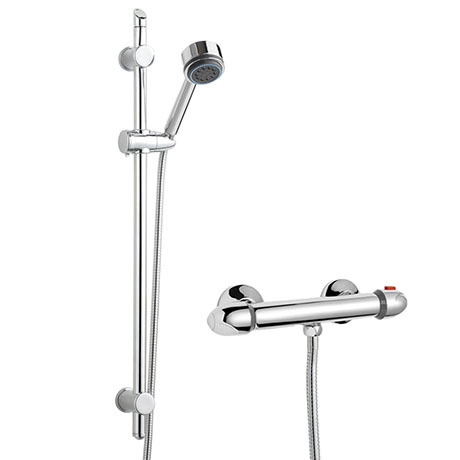 The Chrome Modern Slide Rail Shower Kit with Thermostatic Bar Valve. For total flexibility, complete the look of your bathroom with a Modern shower kit. Modern styling with chrome finish and constructed from solid brass. Features a pre-set maximum temperature and an automatic anti-scald device that make showering safe and convenient. The stylish design of the bat valve and slider rail kit will enhance the appearance of any modern bathroom. Certain parts of slider rail kit are chrome plated plastic, not metal. Great shower. Looks stylish, was very easy to fit and arrived promptly. A brilliant price and a very good service from Victorian Plumbing. Would recommend and will use again. Its very good quality. The design is just what we were looking for and the price was good too. I purchased this item and it arrived the next day - impressive! Im pleased with the quality of the this kit and the fact it comes with a 5 year guarantee.